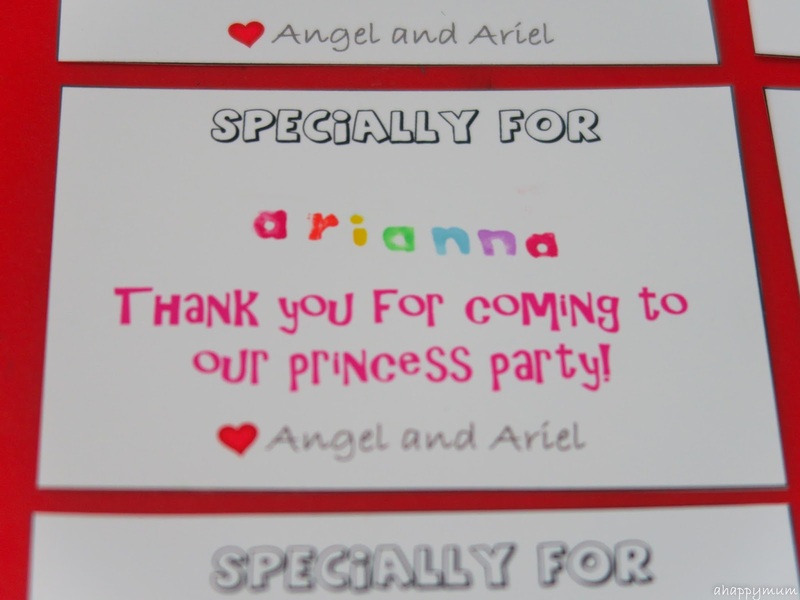 Woohoo, the girls are having their Princess Party very soon and we are all super excited! 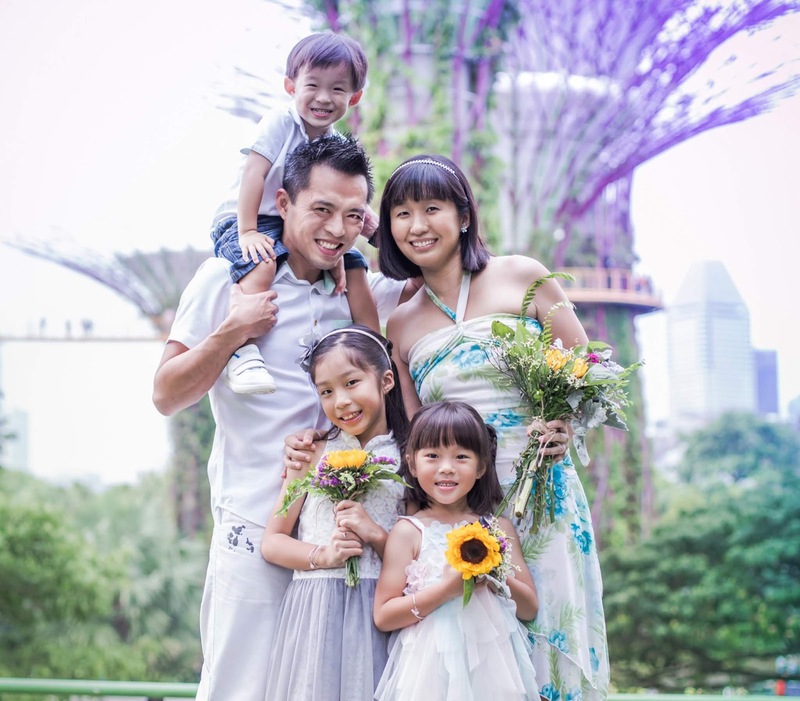 Yes, though I'm feeling totally overwhelmed at home with the planning, designing, packing and coordinating for the new house, it's also a time for us to celebrate and rejoice as the girls turn a year older. And hopefully wiser. 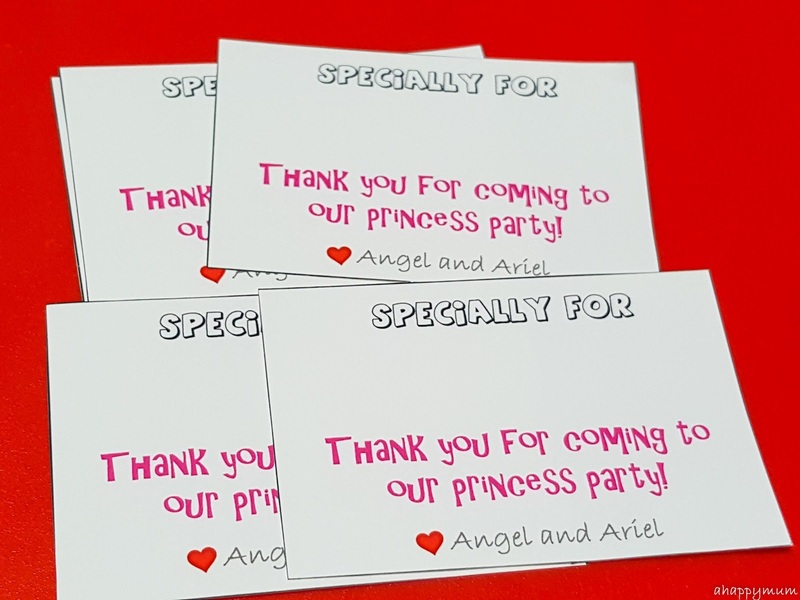 So, we shared about how we made the princess birthday invitations previously and in this week's Creativity 521, here's how we made each and every guest a personalised Thank You card. 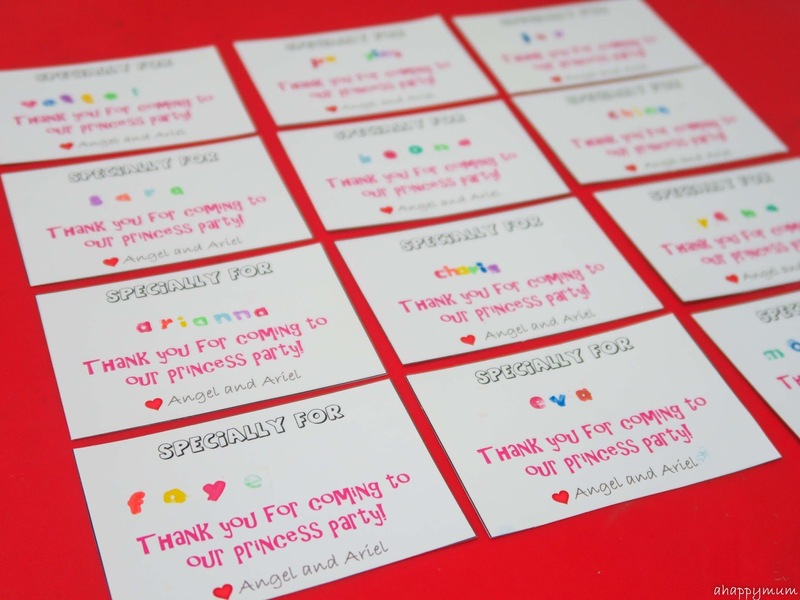 I always think it's important to let each guest know how much we appreciate his/her presence and therefore we always try to include personalised cards in the party favours instead of giving out mass produced ones. 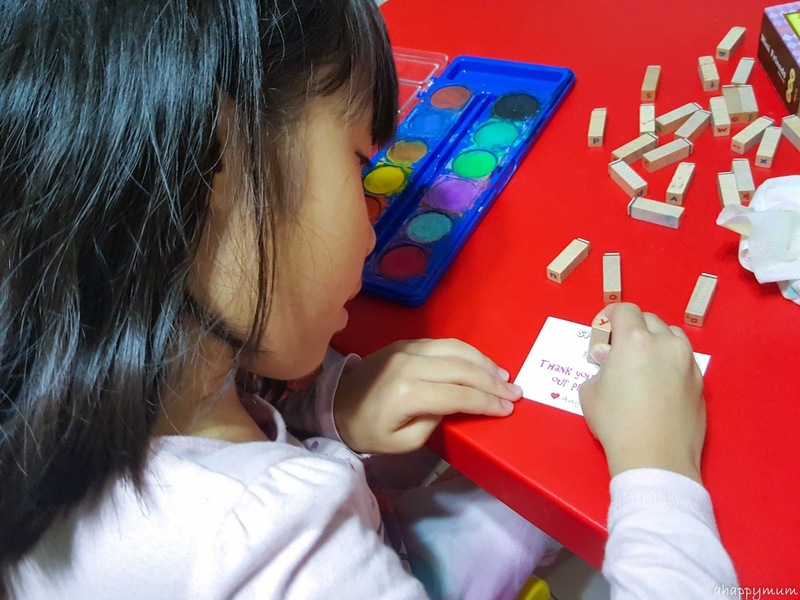 No matter how old or how young these friends are, I hope they feel a tad special when they see their names and know that they are truly cherished and loved. To start off, I used Powerpoint to design and print out a simple card template with the above message. I left an empty space for the girls to work on the names. 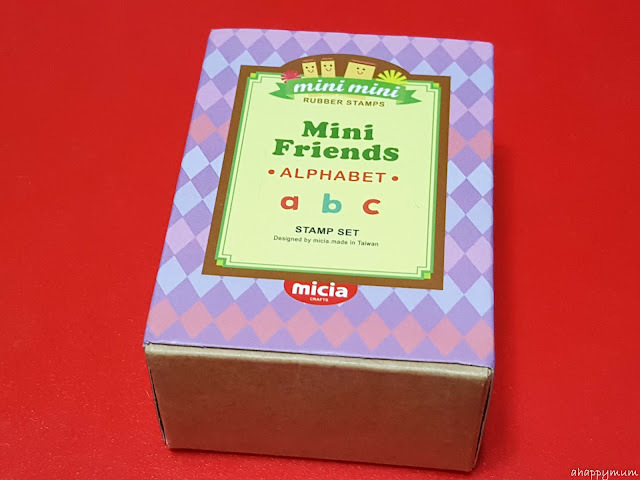 We bought this mini alphabet stamp set from Popular and I thought it would make a very fun activity for the girls by asking them to stamp the names of their friends onto the cards. The stamp set comes with stickers and wooden blocks so all you have to do is tear up the stickers, stick them individually onto one side of a block and on the other, stick the corresponding letter label. 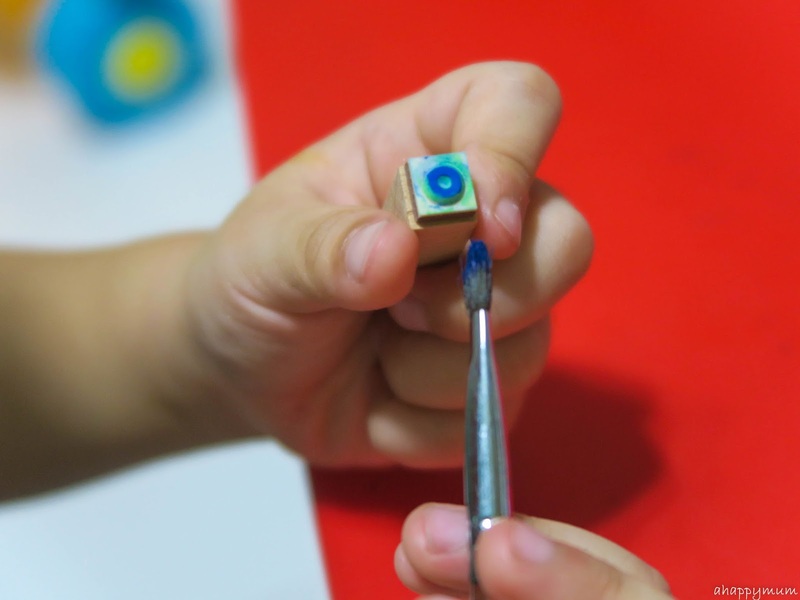 You know what is part of the fun for the 4-year-old? Hunting for the correct letter and practising her alphabets at the same time! 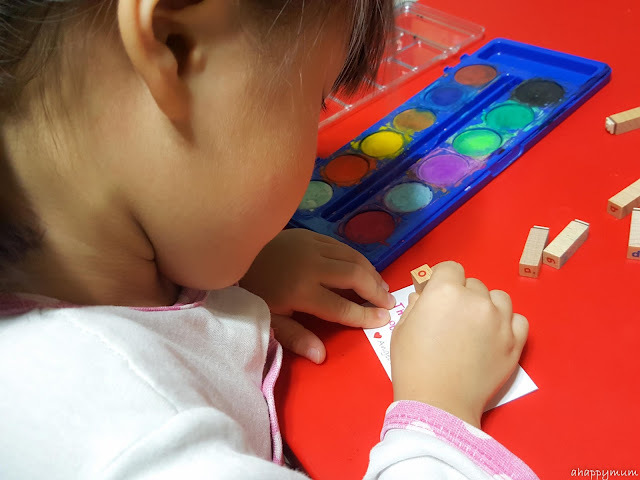 I wanted our letters to be colourful so intead of using ink pads, which would have been much easier and hassle free, we chose to paint every letter and applied water colour onto the stamp. It might sound easy but it did take us a fair bit of time (total of 3 nights) to finish up the stamping for all 14 guests. Why? 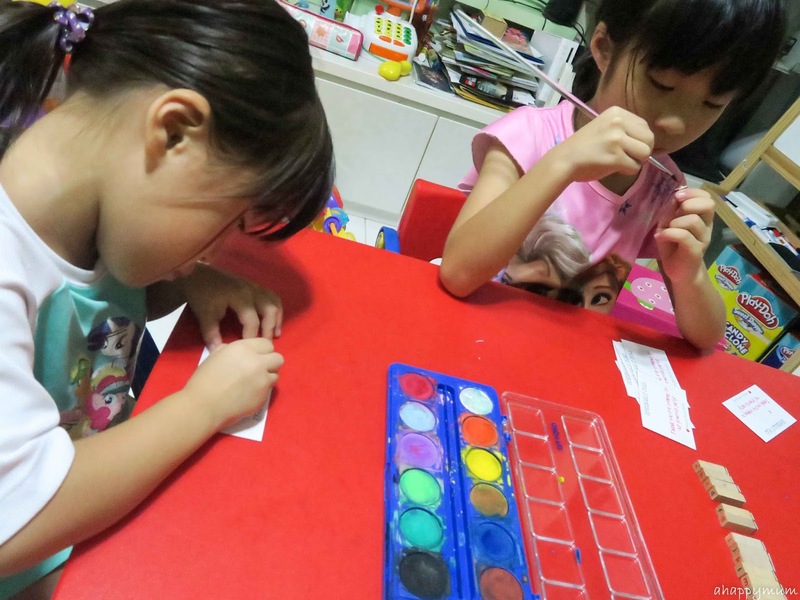 Firstly, the girls had to learn to paint over the letter properly so that it shows up on the paper. 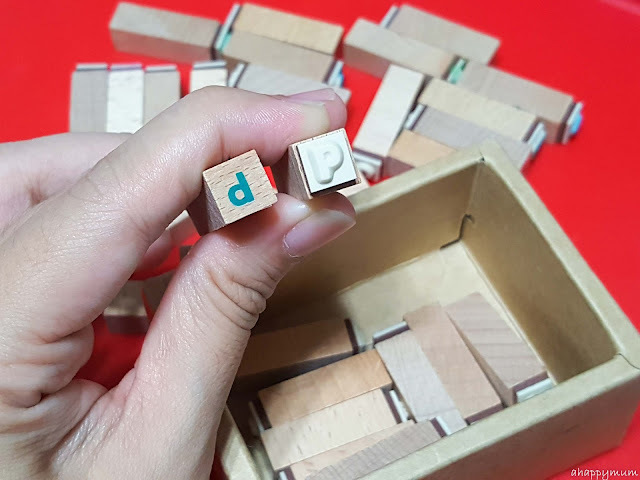 Next, they had to assert enough strength and learn to control it so that the letter gets printed nicely. Lastly, they had to remember to lift up the block in a quick motion and not move it till the water colour smudged. Ah huh. Quite a test of skill and patience. 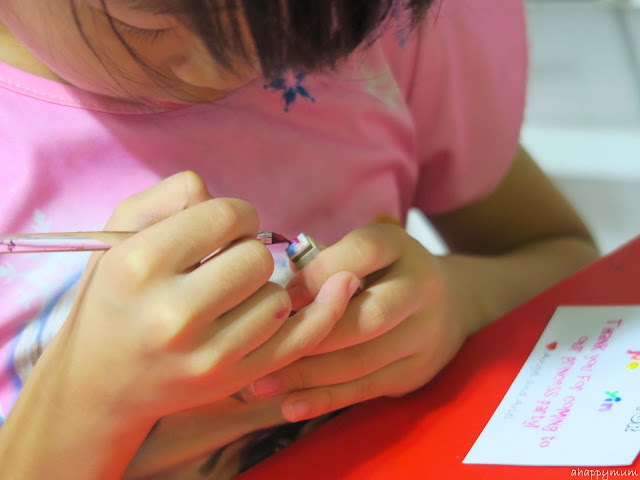 For the big girl, I didn't have to help her at all and being the perfectionist and meticulous person that she is, she would also request to redo the card and ask me for a new one when she made a mistake. 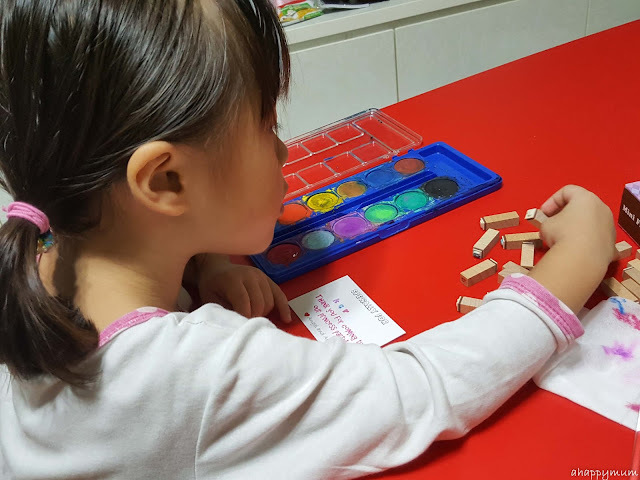 As for the little one, she is also growing to be more independent and would even push away my hands should I try to help her too much. Oh well, yes yes, this mama needs to learn to take a back seat and let you girls run the show. So bit by bit, letter by letter, they did it and they did it all. 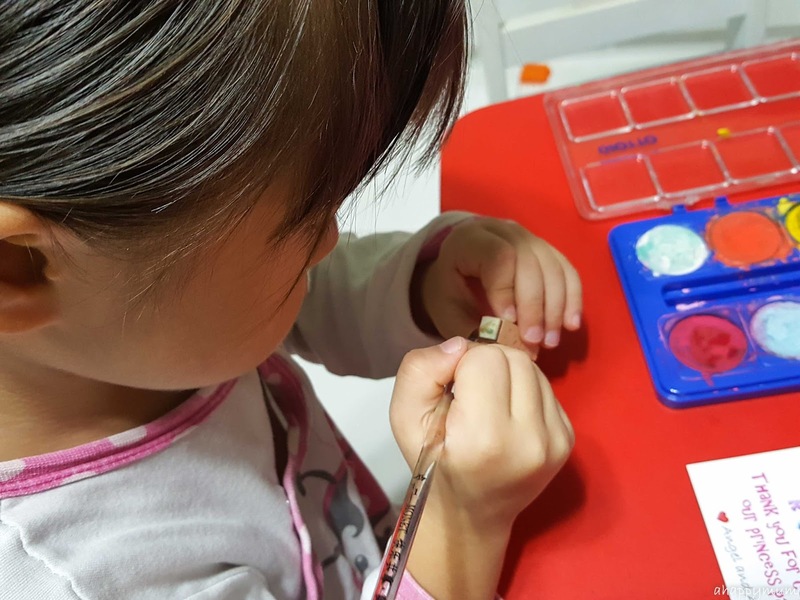 I would remind them to wash the brushes after every letter and clean the stamp using wet wipes so that the colours remain vivid and distinct. 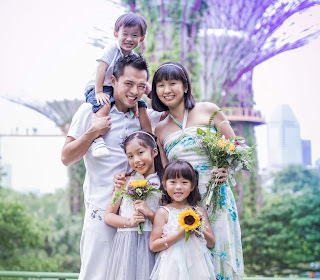 Yes, here are the fruits of our their labour! They might be really easy to make but each speaks of love and sincerity. 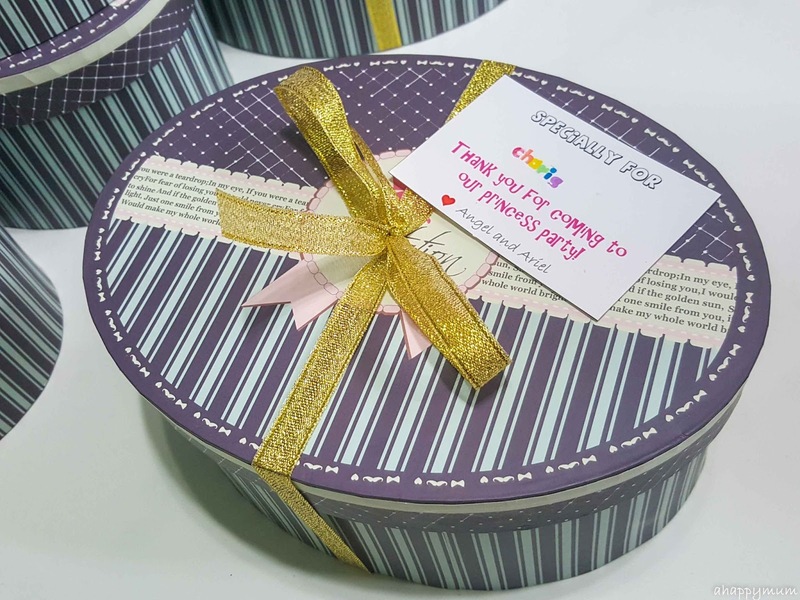 Now, it's time for us to pack the party favours! 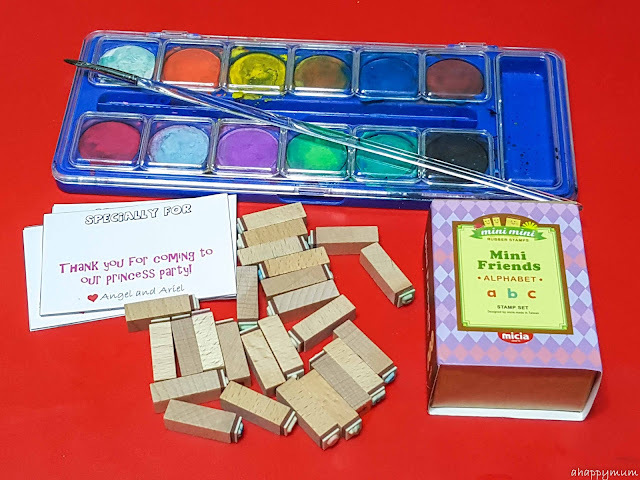 I'm not going to reveal what goes in there now in case it spoils the surprise but they are just some simple, girly, handpicked presents for our guests. 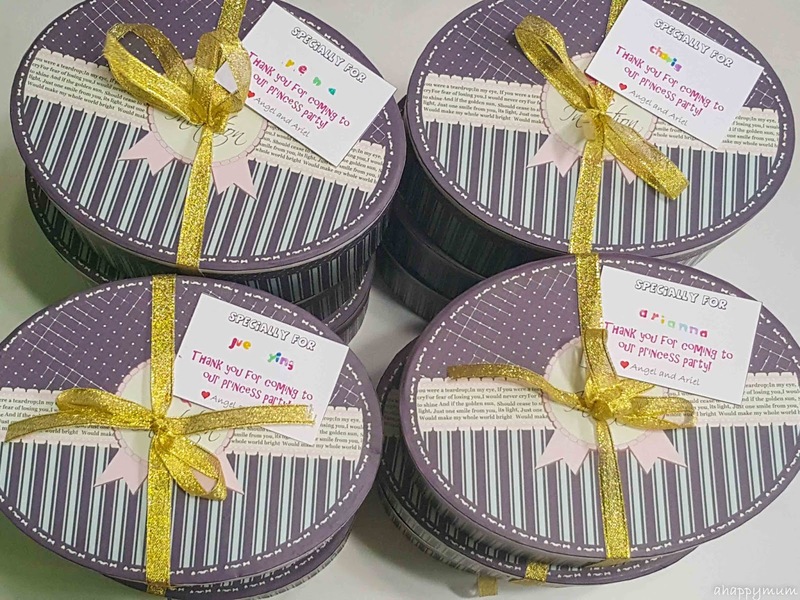 These beautiful gift boxes are bought from Daiso and the gold ribbon is our own. Don't you think the Thank you cards really made a difference? I do! So, till more updates after the Princess Party and we can't wait to share more updates with you very soon!